Former New Jersey Governor James Florio attented the Rebovich Institue event at Rider on April 4. 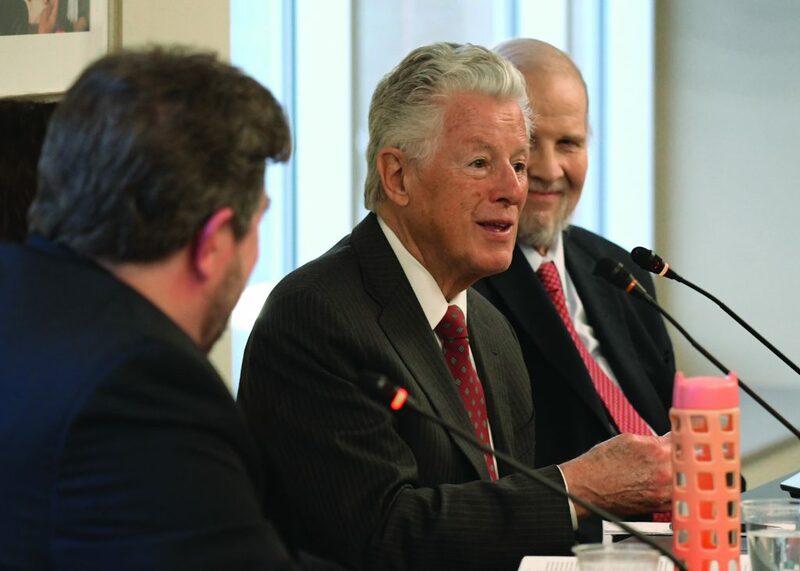 The Rebovich Institute for New Jersey Politics hosted a panel of speakers, which included the 49th Governor of New Jersey James Florio, to discuss the future of the Pine Barrens of New Jersey, or the Pinelands, on April 4. Alongside Florio was Pinelands Commissioner Edward Lloyd and Assistant Executive Director at the Pinelands Preservation Alliance, Jaclyn Rhoads. Each took turns discussing issues facing the Pinelands, which was established as the country’s first National Reserve in 1978. It spans approximately 1.1 million acres of farms, forests and wetlands. The hot topic of the discussion was the prospects of oil and natural gas drilling off the coast of New Jersey and what implications it would have on the Pinelands. In March, the Pinelands Commission, which is a state agency that consists of a 15-member board, voided the approval of a proposed 22-mile natural gas pipeline that would have entered 10 miles of protected Pineland area. Rhoads emphasized the economic and environmental importance of the Pinelands. “The natural resources that we have in the Pinelands are not only integral to the plants and animals that live there but also for us,” said Rhoads. Rhoads highlighted the Kirkwood-Cohansey Aquifer which contains around 17 trillion gallons of fresh water that “provides millions of people with drinking water.” She also explained that the Pinelands are home to “some of the rarest and most threatened” species of animals in the world. “One of the things the CMP did was set up management areas in the Pinelands to direct growth, or where growth should occur and preserve areas that should be preserved,” said Lloyd. All three panelists praised the overall structure and model of the Pinelands Commission and the CMP. However, they agreed that when individuals get into those positions and do not follow the rules or have the interests of the Pinelands as a priority, the commission and plan can be ineffective. Although these flaws may exist, Lloyd was adamant that the mere existence of the commission is a positive for public discourse. Florio predicted the continued importance of the Pinelands to the economy. He highlighted the shift from fossil fuels and other energy sources to more natural resources. As an example, he highlighted how the Israeli government’s water policies have transformed a situation of water shortage into water abundance. “Water is the new oil. Oil, in the last century, was the lubricating factor in our economy,” said Florio. The speakers touched on a number of other topics — global warming, the permit process for companies wanting to work or expand into the Pinelands and the backlash the commission has received from a number of angles. Freshman political science major Matthew Schantin found the discussion to be very informative. Director of Rebovich Institute for New Jersey Politics Micah Rasmussen was excited about what the discussion accomplished. The Rebovich Institute will host United States Attorney for the District of New Jersey Craig Carpenito, who graduated Rider in 1996, on April 24 at 6:30 p.m.